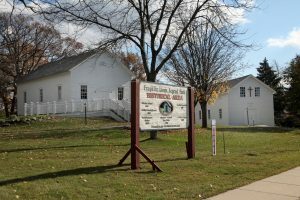 Protestants from Wittenberg, Germany settled in the Town of Franklin in the late 1840s and formed the first Free Congregation in Wisconsin, a continuation of the free-thinking congregations which existed in opposition to the state church in Germany. In 1851, the Franklin group acquired an acre of land for a cemetery and built a colonial-style meeting house on the plot’s southeast corner. Although Free Congregations spread to other areas of the state, membership in this particular German cultural group never exceeded thirty-five or so, and most of the members had died or moved away by 1905 when the meetings were terminated. A Historic American Building Survey team of architects urged the building’s preservation by descendants of the original members. The 24 by 36 foot structure, built of hand-hewn logs still contained the original pews, lectern and stove, and was decorated with portraits of Benjamin Franklin, Alexander von Humboldt and Thomas Paine. 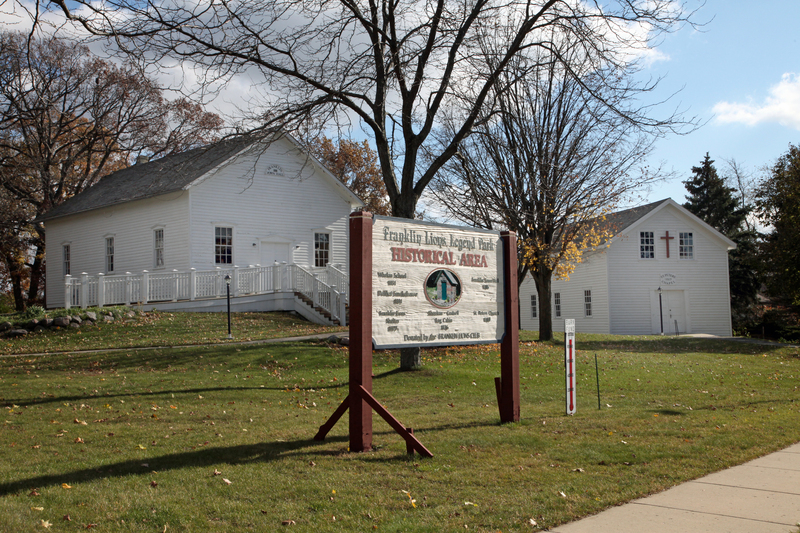 The Painesville Memorial Chapel Association was formed to preserve the building and a basement was dug and cement stairs built at the entrance. On July 19, 1942 , the son of the original speaker, Christian Schroeter was present for the building’s rededication. One of the oldest marked burial grounds in Milwaukee County is the Carman family cemetery in Franklin near the Milwaukee County House of Corrections. Edmund Carman, the original owner of the site was an Englishman who came to the Franklin area in 1837. Two years later, he bought 160 acres of farmland, setting aside less than one-half acre for a cemetery. There are twelve remaining markers with the earliest gravestone that of Eliza Carman, dated February 19, 1839. Two of her brothers, Francis and Edward are buried there as well as Edmund Carman and his wife, Ann Newington. Several non-family gravestones also mark the plot, including two founders of the Town of Franklin, Elias Burr and Hiram F. Smith and others important to the early political life in the township. The site was first mentioned as a cemetery in the property records of Edmund Carman when his children sold part of the original acreage in 1874. The Burwood Stock Farm purchased the property in 1930 and sixteen years later sold the land to Milwaukee County indicating in the deed the exact location of the cemetery. According to the property records, a stone wall once surrounded the burial site although it is no longer visible. 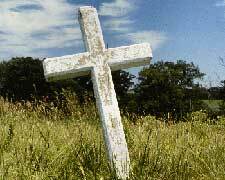 A white cross now dominates the center of the cemetery. 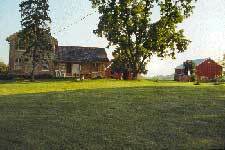 This farm, originally owned by Nicholas Michels, who migrated from Germany in 1853, is regarded as the finest surviving example in Milwaukee County of a Civil War Era Italianate farmhouse. The Italianate style, which appeared in the eastern part of the United States during the 1840s, became popular during the period between 1860 and 1880. Its widest application to residences was in gabled-roofed L-shaped buildings with window frames with rounded tops, two stories in the main block, and one or two stories in the kitchen wing. Houses of quality workmanship were constructed of cream brick and included decorative features such as roundel or lunette windows in the gables and drip moldings around the upper portions of the windows. During that time there were hundreds of urban and rural residences of this type. The Nicholas Michels House, constructed during 1867-1868 of “Racine” cream brick (with a greenish cast) was particularly rare because it has rounded tops to its window panes and its original shutters. The barn and other farm buildings represent an important example of Milwaukee County’s agricultural heritage. The owners at the time of landmark designation, Mr. and Mrs. Balistreri, faithfully preserved the farmhouse’s façade. 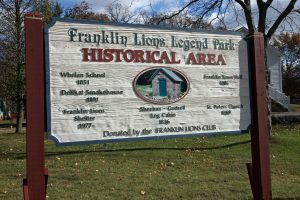 The four buildings located in Lion’s Legend Park that make up the Franklin Historical Society Complex are a permanent reminder of the pioneer heritage of this area. The complex consists of the Whelan School, the Town of Franklin Town Hall, St. Peter’s Chapel, and the Sheehan-Godsell Cabin. The Whelan School: The original school, constructed in 1852 was 24 ft. long and 18 ft. wide. By 1877, a new building was authorized to be built. The school was purchased by the Franklin Historical Society in 1969 and moved from its original site on Hwy. 100 and Puetz Road to Lion’s Legend Park. It serves the community as a living museum of a one-room rural school in Franklin’s pioneer past. The Franklin Town Hall is a symbol of the form of government which was common in the early days of this country. In 1884, following many years when homes and other buildings were used for meetings, a Town Hall was constructed. By 1856, when Franklin became a city, the building no longer was used for meetings but housed the Engineering Department, then the Police Department, and finally the Justice Court until 1970. The structure was moved in 1975 by the Bicentennial Commission to Lion’s Legend Park where it is now a museum. St. Peter’s Chapel was built in 1869 on South 68th Street just north of Loomis Road. In its early years a Lutheran school held its classes in the chapel, while the pastor who served as the teacher lived on the second floor. The Sheehan-Godsell Cabin was built in 1836 by Michael Sheehan and his brother Patrick who came to Franklin from County Cork, Ireland. By the 1850s, a two-story addition had been built. In 1851, when Michael was killed by a beam while helping build Holy Assumption Church, Patrick bought his brother’s share from his heirs. He in turn, sold the cabin to his sons William and Dennis in 1869. Michael Godsell bought the farm in 1920 and lived there with his family until 1967. The farm was then sold and the land was subdivided. The cabin was moved by the Bicentennial Commission to its present site in 1975. The first church was built in 1847 on a site that was the Kenneth Sweeney homestead which was once part of the Garret Fitzgerald farm. The first parish members gathered in Michael Sheehan’s log cabin for services during the winter months. A fire destroyed the log church in 1866. While the men from the surrounding farms were rebuilding the church, Michael Sheehan was killed by a falling beam. The present brick church was completed in 1867. Built of cream city bricks, Holy Assumption is a very simple structure. Four gothic shaped windows of plain glass set in small square panes let in the light on each side of the church while two windows flank the entrance. A louvered bell cupola is topped by a small steeple. Inside, the walls are painted off-white and the pews, woodwork and waist-high wainscoting are pale beige. Six kerosene lamps with fuel visible in the bases are set in black wrought iron brackets fastened to the window frames. A winding staircase at the rear of the church leads to a choir loft. The apse, a vaulted recess containing the altar, is wallpapered in an intricate green, gold and ivory pattern. There are 26 pews for the approximately 100 families who were members in the church’s early years. 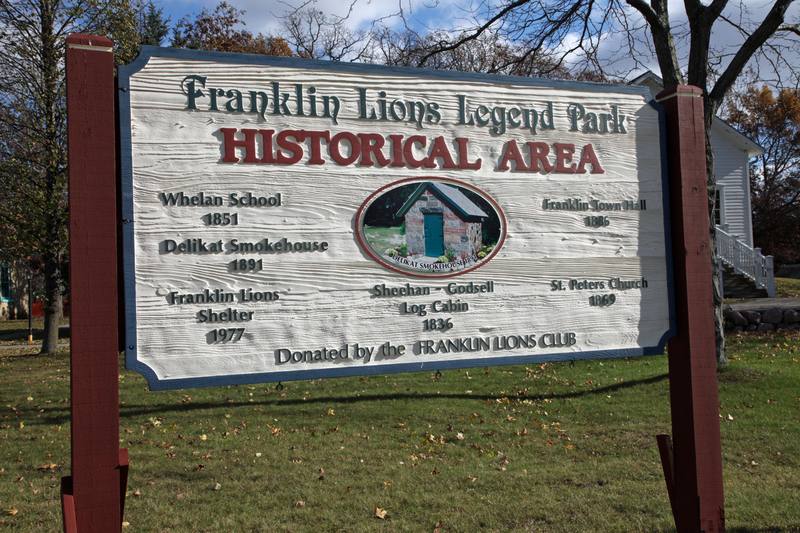 Beginning in 1969, the Franklin Historical Society, City of Franklin and Franklin Bicentennial Commission have partnered to dismantle, move and reconstruct several locally historic buildings to Lions Legend Park, creating a “historic village.” The district includes the Sheehan-Godsell Cabin, Franklin’s first European-style log cabin, built in 1836; the Old Town Hall, which opened in 1886; the Whelan School, built in 1878, was one of seven late 19th century schools to educate Franklin’s children; St. Peter’s Chapel, erected in 1869; the 1891 smokehouse from the Herman Delikat farm; the two-seat outhouse from the Fred Ludwig homestead, built in 1908; and an 1880s barn which is being reconstructed and slated for opening in July 2018. These living museums are key components of the Franklin Historical Society’s commitment to educational and community enrichment.